I found myself in a curious turn of events earlier this evening. I was talking (texting) with a friend and out of nowhere I insisted she guess what I was up to. Now, as an established knitter, and someone who has worked in several knitting stores, and in fact writes on a semi-regular basis about knitting, and also in fact does some pattern design, this should really not come as a surprise. The last week or so has been busy busy busy and when I finally carved out some time today (perhaps I should have kept on with homework, but a knitter’s gotta do what a knitter’s gotta do) it was really relaxing. So much so, that in fact it caught me somewhat unawares. This led me to think about why I knit. I mean, I know that I enjoy it, but why do I enjoy it? Well, I do find it relaxing – especially when I’m working from a pattern, it’s an easy way to unwind a bit, even with some very complex patterns! I think that a large part of my enjoyment comes from using my brain in ways that I don’t typically get to in my day-to-day affairs – a bit of a brain massage if you will. 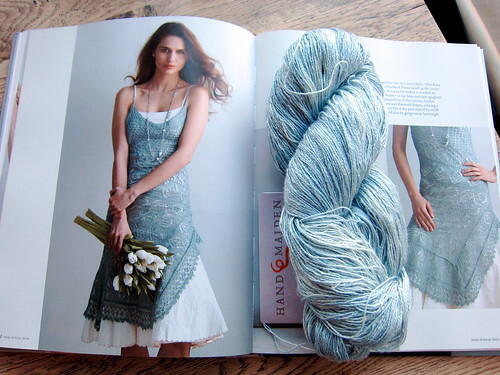 Tonight I am knitting on the Shetland Shawl Dress by Teva Durham, found in Loop-d-Loop Lace, so this is certainly a case of relaxed knitting, no need to really pay attention beyond following the charts. Why do you knit? Do you like to zone out, or use it as an opportunity to focus and flex your mind muscles? Are you content to follow a pattern blindly, or do you need to make extensive modifications or even design your own pieces? This entry was posted on Monday, January 14th, 2013 at 8:53 pm	and is filed under Uncategorized. You can follow any responses to this entry through the RSS 2.0 feed. Both comments and pings are currently closed. Why do I knit? It’s a good question. I love that it can both relax and engage my mind, depending on the project. It has definitely improved my memory. Even if you zone out, it does require a certain amount of concentration, but it’s still a task you can do while you watch podcasts or listen to music. I knit because I caught the bug. I love making things that are beautiful, functional, comforting, colourful, fun. 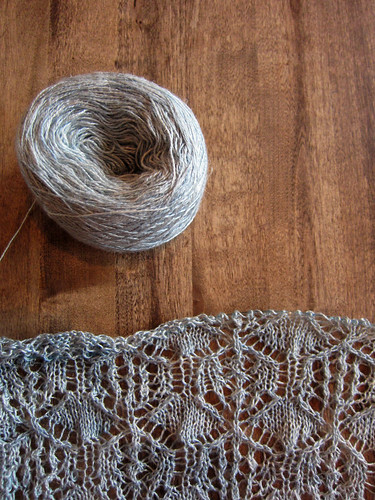 I knit because I can, and I have to!